Akshay Kumar and Kareena Kapoor are all set to recreate their magical chemistry on-screen. The Khiladi star in an interview expressed his excitement about his upcoming project which has been named as Good News. There were earlier reports about a film by Dharma Productions that will bring together Akshay and Kareena after three years. This seems to be a great news for the fans who are waiting to see the sizzling chemistry of Kareena and Akshay on the silver screens again. The two were last seen together in the film Gabbar Is Back released in 2015. 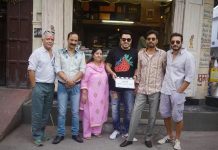 The upcoming film will be directed by Raj Mehta and the makers already have a release date. Good News is expected to be released in theatres on July 19, 2019. Kareena Kapoor and Akshay Kumar’s chemistry was worth a catch in Gabbar Is Back. On the individual work front, Akshay Kumar was last seen in the film Padman and is currently looking forward towards his upcoming film Gold which will mark the debut of TV actress Mouni Roy. Kumar has a number of films lined up for 2018 and 2019. Kareena was last seen in the film Veere Di Wedding which also starred Sonam Kapoor, Shilha Talsania and Swara Bhaskar. The film was directed by Shashanka Ghosh and produced by Rhea Kapoor and Ekta Kapoor.